I wear gloves not just for free motion quilting, but, for some straight line quilting too, if I’m going to be turning it alot. But mine aren’t from the quilt shop. 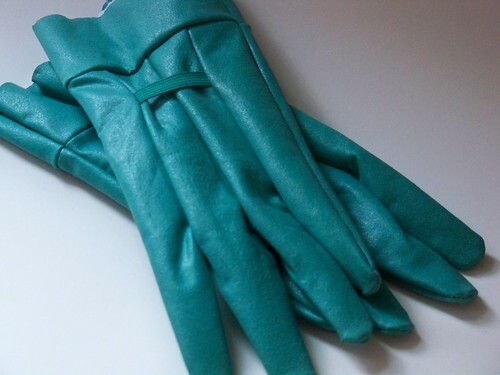 I get these gardening gloves from a discount store for a few dollars. 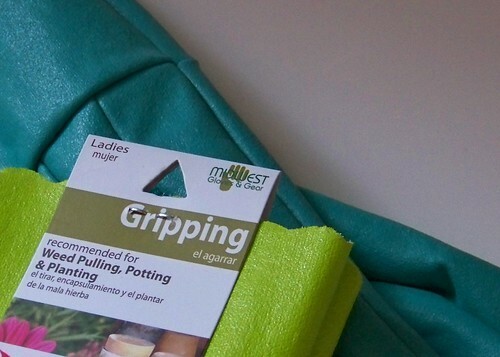 They’ve got this strange, grip-y texture designed for weeding, but that works great for quilting too. And, they come in pretty colors. I just bought these new ones — one pair to use, one pair for spare — since the stickiness on the fingers of my last pair finally wore out. So, anyone else have unusual crafting supplies? Sew Mama Sew is talking about thread, and it got me thinking. Well, actually, their reader poll got me thinking. Just not my style, I like to start a project on a whim, and having to hunt for matching thread just slows me down (and isn’t nearly as fun as hunting for the perfect fabric). So I keep a stash of neutral cotton threads that blend with most fabrics — white, taupe, gray (dove gray is lovely for working with cool toned fabrics) — on hand for both the bobbin and top. When I’m ambitious, I even have extra pre-wound bobbins full of white. 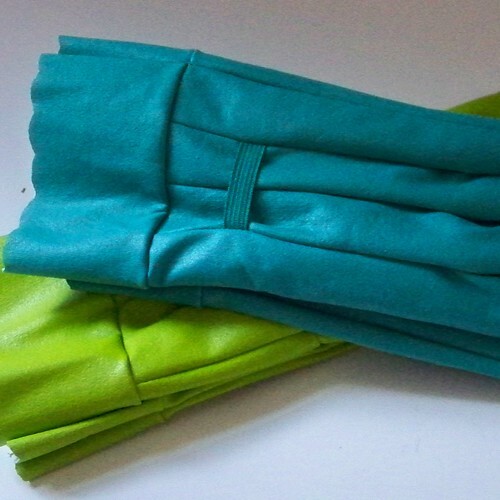 I save the exact color matching for quilting (or other sorts of top stitching) or projects where I’m particularly concerned about matching for some reason. Even then, with my ever-present white sashings, it’s not unusual for me to choose a neutral for quilting. 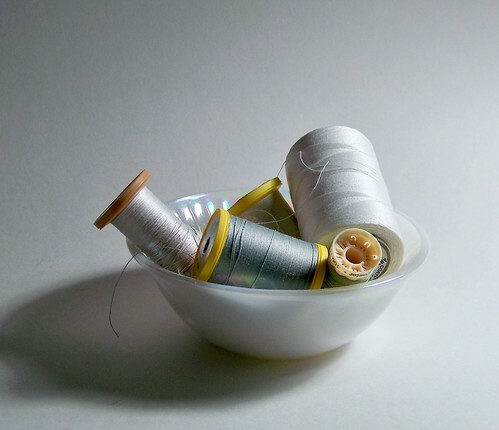 So, there’s a bin on my shelves with more thread, but really, this little bowl of neutrals sits next to my sewing machine and it’s where I turn most of the time. I’m guessing that poll result reflects a lot garment sewing etc. 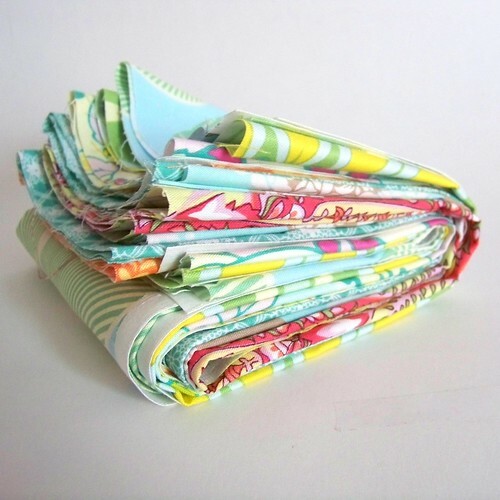 where you can match to one fabric, instead of the jumble in quilting, and among quilters reflects alot of quilting thread as well as the piecing thread I first thought about. But , I’m curious, what’s your thread matching style?